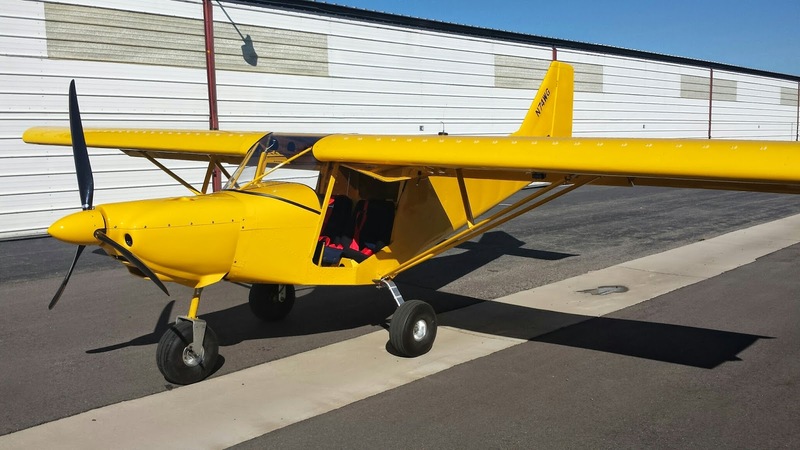 I had arranged to help Tony near Denver to build his new Savannah S. That's a Light Sport aircraft that comes as a kit. All sheet aluminum, all the holes pre-punched. There's about 14,000 rivets, and amazingly, all the holes pretty much line up, so it's just a matter of finding the correct pieces in the box and riveting them together. Just like a big jigsaw puzzle. Tony and I had each built one before, and I had repaired several wrecked Zenith 701s, which are very similar, so we mostly knew what to do. We worked very well together, and when a problem arose, a short discussion and quick agreement led to the next plan of action. So it only took 230 hrs over 20 days to build the structure ready for the paint shop. Must be pretty much a record.... It's a heck of a lot of fun to be able to make such fast progress on a project like that! Tony, and results of first day. I had intended to take a photo every day, but forgot.. This is the result, 20 days later. Tony in the background, and friend Dennis.